Using MS 0.9.5 on Ubuntu Jaunty. Sorry if this has been reported, but I couldn't find anything by searching. If I have too many instruments, then the staves will just push itself off the paper and into the background. In addition, the graphical display will glitch up off of the paper when dragging the score around. I attached a picture. Thank you. 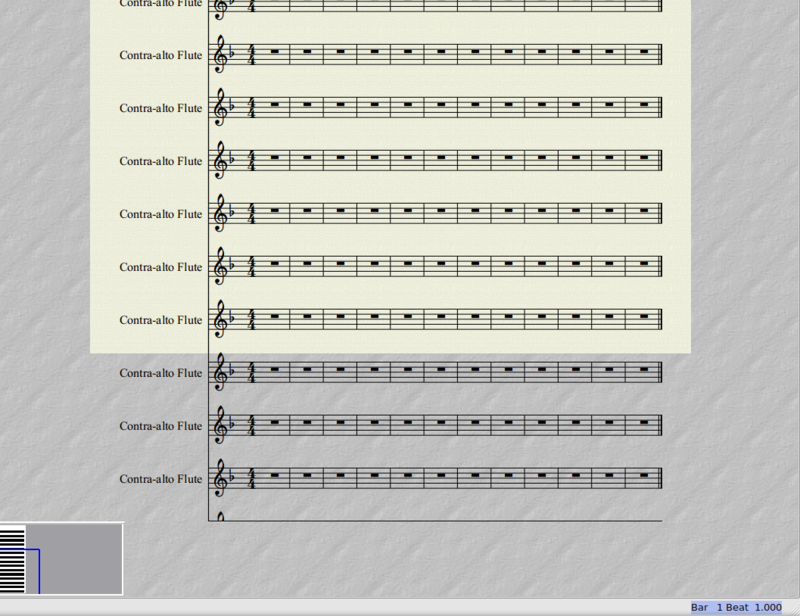 I checked Sibelius, and it appears to auto-resize the paper when you add a large amount of staves. Would this be good practice to mimic? To be clear, picking different templates in Sibelius changes the page size. (MuseScore also allows this see hymn template and violin a5). Adding more instruments to an existing score in Sibelius or picking a page size smaller than the defaul reduces the space between the staves so that they still fit on the page. Finale reduces the size of the staves to fit on the page. Finale's approach usually looks better and is easier to read. I agree. Each expansion of fittable size should be accommodated. Where would you draw the line? and how? No doubt it would be possible to implement something like Finale, but in any case, it's a feature request, not a bug (sorry to resurrect this, but I ran across it searching for something else). Layout > Page Settings > Space (I recommend 1.15mm). Layout: Page Settings. Decrease scaling until it fits. Have a nice day.